From July 8-12, 2002, Bowling Green State University’s HELIX program experienced Johnson’s Island. The prisoners staying at Johnson’s Island during the American Civil War were treated very well in comparison to other prison camps. They ate well, slept well, and were allowed other privileges such as purchasing items from a vendor each day. They could have fishing poles, spears, and other metals with the exception of firearms. Officers were treated well and even allowed to have slaves. Many preserved their Southern lifestyles in their food. The food eaten by the prisoners came from three major sources. The Union government provided much of the food eaten by the prisoners. They provided pork, various forms of beef, coffee, sugar, and other food items. The government decided the rations given to each prisoner. The prisoner received a great deal of food from the mail, the arrival of which was looked forward to each day. Captain Littleburg W. Allen recalls receiving “cabbages, potatoes, apples, butter fowls, spare ribs, sausage meat, apple brandy, honey and corn bread.” The prisoners themselves provided the rest of the food eaten. Prisoners supplied enough of their own food to eat comfortably. They were permitted to fish in Lake Erie and also found ways to kill birds and turtles. In the winter of 1864, word of Union prisoner treatment in Andersonville and other Confederate prisons caused them to cut rations to the Confederate prisoners. This included those on Johnson’s Island. The prisoners soon began to feel the pangs of hunger and as William Peel recalls, “We had spoiled beef for the second day.” The prisoners were not eating as comfortable as they previously had, and there was barely enough food to go around. By late winter, as prisoners had grown more desperate for food, so did their hidden bunkmates, the rats. The rats were now forced to steal food from the prisoners, and scampered about unchecked. In response to this, the prisoners used their new adversaries to their advantage. They hunted the rats. Their first motive to hunt the rats was as a source of food. Soon, however, it became game and entertainment. Prisoners would all join in to hunt a rat, hitting it with boards, sticks, or whatever else they could get their hands on. Without the rats, the food would not have been substantial enough to keep the prisoners alive. Because the lake was often frozen over, supplies could not reach the island. The guards occasionally followed the prisoners’ example and hunted rats for their own food. 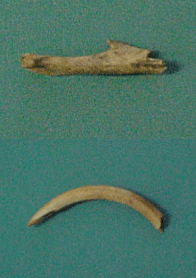 Evidence of their cooking can be found in many excavation blocks in the form of burnt animal bones. After the winter of 1864, the prisoners’ food rations gradually returned to normal. They were able to eat as they had before. Without the rat hunting, however, the winter could have been much darker than it really was. This is a picture of the fragment of bitter bottle. The only letters featured on this fragment are as follows: On the top row we can see the letters G O U and it seems that the last letter is an L. On the bottom row we can see the letters B I T T, which identified this as a fragment of a bitter bottle. Our first day was lab work. This particular work included cleaning the artifacts found in a previous week. It took nearly three hours to clean 1,480 excluding all of the bricks (about 550!!!). The first field specimen for our group was found by yours truly (Kaitlyn). It was embossed glass used for drinking contraband beverages (aka beer). Later that evening we counted and cataloged the data. The real fun stuff will come tomorrow. We got a late start today. We reached Johnson’s Island at 9:30 A.M. We visited the cemetery and learned some background information, like the life of the soldiers and how they were treated. We finally reached the site and started to understand the true meaning and techniques of archaeology. Laurie found her first field specimen. Go Laurie! At lunchtime every day we ask questions regarding the site and Dr. Bush reads diary entries from that particular day. Once we returned we had a three-hour break, and then we returned to cleaning the artifacts. Tomorrow, hopefully, we’ll find some more field specimens. We were on time reaching the island. We are behind in our digging, but there are newly added field specimens, mostly cut shell. Everyone now has at least one fs, hip-hip hooray! The lunch discussion was just interesting as yesterdays, but a little more gruesome (Andersonville diaries). After that, we went to Fort Johnson. Fort Johnson is a military fort used for protecting the prisoners and the island. We returned to excavate and sift some more. We returned and cleaned and cataloged some more specimens. We hope tomorrow is just as productive as today. We were on time yet again. We found some more field specimens, cut shells, a button fragment, and a piece of a hard-rubber comb. The cut shells represent arts and crafts. The button fragment displays the clothing that the prisoners wore. Lastly, the hard-rubber comb shows hygiene. We got to excavate a one-foot dirt wall. In the process of taking down the wall we found crystal glass. This shows the wealth of the prisoners. We also received help from Company C, because we were still behind. We continued to clean and catalog once we returned. We sadly depart knowing tomorrow is our last day. April is reminding us to use our heads and think. Today all of the work finally comes together. We worked hard and are proud of what we have found and accomplished. Our parents came to see our presentations at 4:30. We learned one lesson from our supervisor April, to think. We say good-bye with heavy hearts. Prisoners on Johnson’s Island kept the ways of their lifestyle, even during their incarceration on the island. While we were working at the site we learned about a few of their ways in doing this while we were here. The first of these ways was to purchase or make contraband items. The major one of these was liquor which was either smuggled in and sold to the prisoners or was bought and then smuggled in. The other way to obtain liquor was to brew it on your own. Although the attempts were good, many ended in failure. Another way to keep the Southern lifestyle was to use finer, more attractive dishes. One way to do this was to buy expensive crystal glass goblets and dishes instead of the cheap stoneware provided by the Union. In some cases, though, the men did not have enough money or did not want to spend a lot of it, so they bought cheaper imitation crystal glass. The imitation glass was cheaper glass that was given an additive that made it look identical to the more expensive glass. After ten years or so, the imitation glass began to take on a purplish tint and was therefore seen as less expensive glass. The real crystal glass remained clear. In addition to buying glass, the prisoners also made furniture to make their stay more comfortable. The prisoners would make chairs, tables, blankets, and desks. To get wood to do these projects, the Rebels would have to buy wood from salesmen in Sandusky. They had to do this because unlike today the prison complex was nearly empty of trees. In order to occupy their time, the prisoners made crafts and games with odds and ends from around the complex, a few were purchased from the suttler, or in the case of shell, was sent to them from the South. A majority of the things they made were carvings of shell, hard rubber (patented in 1851 by Nelson Goodyear), wood, and bone. Many things have been found that were carved by the inmates such as chess or checkers pieces, crosses, combs, rings, buttons, and other assorted jewelry. In order to communicate with the world, and to leave their memories forever, the inmates wrote letters and diaries to their families and friends. Much has been learned about the quality of life on Johnson’s Island from these recovered writings. Even though the prisoners were hundreds of miles from their homes, they were able to keep their lifestyles and traditions alive, even in the far north of Johnson’s Island. This is a hard-rubber pipe found by Katie DeVeau. It is very rare and is the first hard-rubber pipe found in 13 years. Prisoners often made crafts out of hard rubber, but a pipe, such as this one, was probably brought from home or bought from the sutler. This past week, we had the opportunity to excavate a part of Johnson’s Island Civil War Military Prison site with Dr. David R. Bush. Johnson’s Island was a 17-acre Confederate prison, and over 2,500 Confederate officers passed through the prison while it was operating (1862-1865). Digging on an official archaeological site was a unique and inspiring chance that we are glad to have had. We would like to share some of our experiences and findings with you. Our first day in the Johnson’s Island dig program was spent washing and sorting items, learning about Johnson’s Island, getting to know each other, and learning about the science of archaeology. On the second day we went out in the field and learned field techniques first hand. We sifted, dug, counted and sorted the items we excavated. The next two days, we did the same thing, and found a lot of cool field specimens. The POW (prisoners of war) on Johnson’s Island commonly used glass items. We found a piece of an embossed bitter bottle. Bitter had common medicinal uses during the time of the Civil War. Although the Federal Government classified bitter as a medicine, it often had more alcohol in it than whiskey. Although in many prisons alcoholic beverages were contraband from prisoners, bitter was not because of its classification as a medicine. Bitter was promoted to cure stomach, blood, kidney, and liver disorders. Because bitter bottles were used to hold liquid consisting of both an herb concoction and liquor, and because the glass was thick and curved, they are classified as container glass. Other types of bottle fragments that are classified as container glass are ones that were used to store food, hold ink, and store liquor or medicine. Glass food containers were pre-packaged with food and could be used again and again. Liquor bottles were usually narrow-mouthed, and their color, shape, and size depended on the way in which they were manufactured and packaged. Another kind of glass is flat glass. Flat glass was used in windows. It is almost always clear. 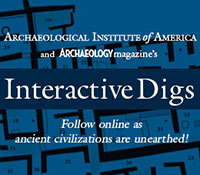 This experience, I’m sure, challenged us all and gave us an idea of what archaeology is really about. We would like to thank the team, the HELIX program, the volunteers, and Dr. David R. Bush. Thank you for letting us have this wonderful experience. This entry was posted on Friday, July 12, 2002 at 3:32 pm	and is filed under From the Students. You can follow any responses to this entry through the RSS 2.0 feed. Both comments and pings are currently closed. So happy that I found this site. My colleagues and I were just discussing this the other day.